The First German Church was organized in 1896. Henry Schock donated the land for the church and cemetery. There is no known date for when this church closed, but the building was sold in 1941 to the Lutheran congregation in Naper. The cemetery is still in use today. Some of the early burials were of two young children of Conrad Stahlecker who died in November 1898. The cemetery and school were on land owned by George Lueken. The cemetery was just across the road south of the school. After several bodies had been moved elsewhere, the school children hid in the empty gravesites when playing hide-and-seek. In the late 1800's a sod church was built two and one-half miles west of Naper for the German-speaking people of the Congregational faith. Later a wooden church was built approximately one mile north of the sod church. No definite date for the final services in the church is known, but it is believed to have been in the late 1930's. The graveyard still remains and is still in use today. One of the early burials was John Giedd in 1911 who was crushed by 300 pound barrels of salt that he was hauling; his horse stumbled going down a hill which upset the wagon. This cemetery is located approximately a half mile east of Naper on the north side of Highway 12. Originally known as Naper Cemetery it was later changed to Knollcrest. Mason S. Wakefield was probably t;he first person buried there in 1901, perhaps on the Wakefield farm, about a year before the land was purchased for a cemetery. In 1906 land was purchased from R.R. and C.L. Naper. Additional land was purchased in 1935 from A.S. Kandyba and in 1952 from Joe and Bertha Schmitz. Zilpha West was also buried in the older part of the cemetery. Frank Green was a caretaker many years as far back as 1910, followed by Albert Dalldorf until 1981, who was followed by Harley Nicolaus. Many pioneers were laid to rest here, among them a well-known pioneer doctor, Dr Charles Zimmerman. George Sutherland (1807 - 1919) was perhaps the oldest buried here at 112 years of age. There are memorial headstones for Charles Alexander, Jr who was lost at sea in 1943; as well as for Isaac N. Bowen (1838 - 1865) who was a Civil War veteran. Seven other Civil War veterans rest here, as well as veterans from both World Wars and the Korean Conflict. 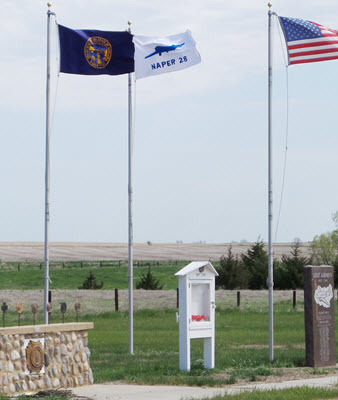 A memorial headstone was added for the 28 Army pilots who lost their lives in a crash of their C-47 transport plane in 1944. The crash site was on the Sattler Ranch south of Naper. Services are held at the Naper Auditorium each Memorial Day followed by Military Services at Knollcrest in honor of all of our loved ones. There are thirty veterans and nine auxiliary members remembered with a flag each year. This cemetery is located on the old White Horse Ranch, and it was deeded to Franklin Leatherman in 1911. The Leatherman heirs have never relinquished ownership to any surrounding land owners. Thus, it is still known as "The Leatherman Cemetery. The Oakdale Cemetery (sometime referred to as the Garwood Cemetery) is located on land donated by Mr. Garwood, an early settler. Mr.Garwood did not stay in the area long, but the cemetery remains. Many early settlers were buried there as well as some recent Basin residents. A Mr. Matson, who lived along Oak Creek, was buried in 1883; John Smith in 1888. Elof Erickson made the sign which hangs above the cemetery gate. Whitehorse Ranch Cemetery: A small cemetery with apparently on two graves is located on the old White Horse Ranch property. Those buried there are H.G. Goble who died in 1885 and P.G. Graves who died in 1883.